Quick and Quack were two brave, sporty little ducks who lived with their mother. Both were really fast, and were always competing against each other. They raced each other in all sorts or places. On land, sea and air; running, swimming, or flying. One day, after visiting their Uncle Ducklass upriver, Quick shouted "last one home is a goose!" and both ducks swam quickly downriver. They both knew the way well, but Quack had been preparing a trick for some time. He had realised that the current in the middle of the river was stronger, and would help him. So, even though Mother Duck had told them never to swim in the middle of the river, Quack paddled over to it. "I'm old enough now to swim here," he thought to himself. It wasn't long before he realised his mother had been right. He was going much faster than Quick, and was developing a big lead. Quick was not amused. He never disobeyed his mother, and now his obedience meant he was going to lose the race! As they went on, the current got stronger. Quack triumphantly crossed the finishing line, without realising he was headed straight for a big whirlpool in the middle of the river. Before he could react, there he was spinning around in it, unable to escape. Getting him out of there was no easy matter. 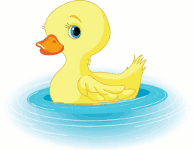 No duck was strong enough to swim in those waters, and poor Quack kept swallowing water. The fact that his head was spinning like a top didn't help matters much either. Fortunately, a cow from a nearby farm came by and, seeing Quack, waded in and rescued him, to prevent him from drinking all the water in the river. When he was on dry ground, he remained dizzy for quite some time. That provided quite a laugh for the various different animals that had been watching. That day, Quick understood that he had done well to listen to his mother, even though at first it might have seemed the difficult option. As for Quack... well... Quack could not forget that experience, even though he wanted to. From then on, whenever he touched a drop of water, he fell to the floor and spun round three times before being able to get up again. Rainy days proved quite entertaining!